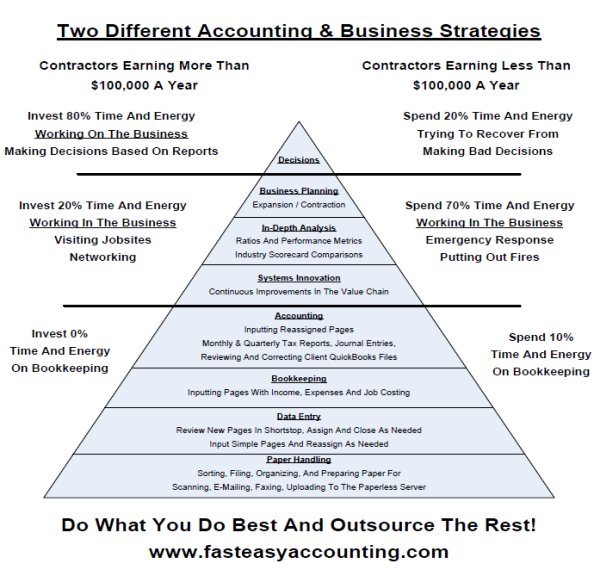 People Ask How We Save - Them $100's or even $1,000's dollar a year when they can do the bookkeeping themselves or hire a Cheap Bookkeeper? 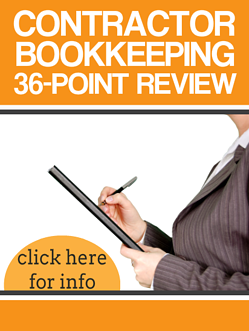 Read our article Cheap Bookkeepers to find some shocking information revealed! Fill out the form for a FREE one-hour consultation! 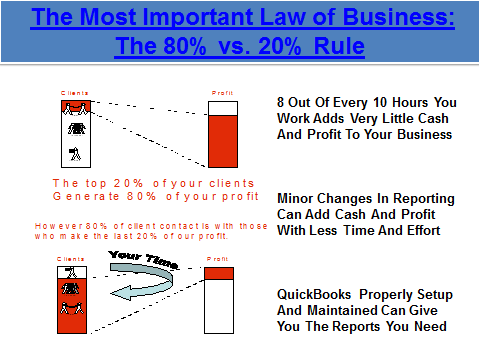 The System Is The Solution - In 1991 while operating a successful construction service and repair business we developed a Comprehensive Construction Bookkeeping System. Since then we have made thousands of improvements and we are continually updating, improving, innovating and enhancing it. Having worked with contractors and seen 100's of QuickBooks files, met with lots of bankers, bonding companies and commercial insurance brokers in addition to our own experiences owning and operating construction businesses. Having owned and operated - Several construction businesses over the past 30+ years we understand a thing or two about best practices when it comes to Construction Bookkeeping And Construction Accounting as it relates to owning and operating a profitable construction business. In 2004 Our Co-Founder Randal DeHart - Passed the PMP (Project Management Professional) exam with an emphasis on systems engineering and process development which means the improvements to the system and faster and the focus is on delivering services that benefit you our client. One Of The Keys To Success - Is intelligent delegation, relying on processes, not abdication, letting people do whatever they please. This means we have processes and procedures for how tasks are done, in what order similar to an assembly line. The table and diagram below shows how tasks are delegated to the lowest skill level and yet everything is reviewed by a competent accountant! 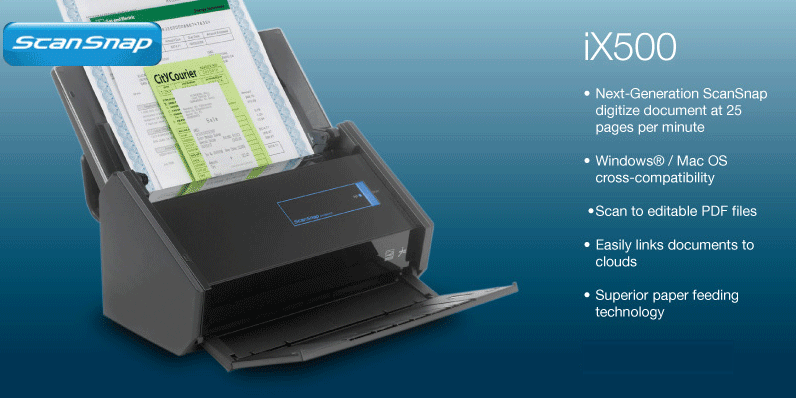 Use one of our recommended scanners and send paperwork with the push of a button! If you get this scanner, we have people who can set it up remotely and link it to your Paperless Document Vault. You simply load the documents; push one button and the documents are automatically scanned and uploaded to your company’s Paperless Document Vault Inbox. 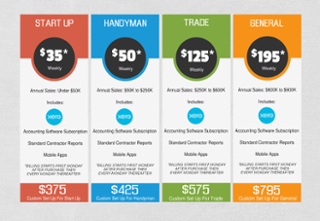 Our contractor bookkeepers retrieve the documents; input them into your QuickBooks file. Next, the documents are filed in a way that makes it fast and easy for you look any saved document, download it, print it or email it. What paperwork do we want? 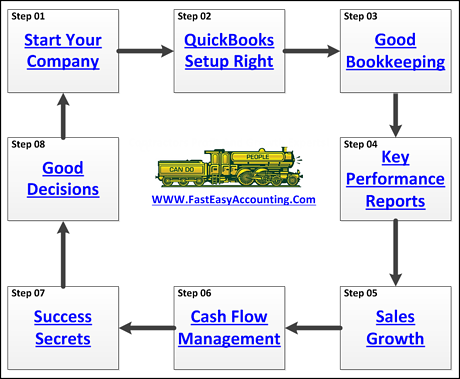 The short answer is all of it and we will sort it out between what goes into QuickBooks for Contractors and what is not. You do not have to organize any of your paper before bringing it to us because we have a process for that. Paper documents arrive in bags, boxes, envelopes, pouches, carts and other methods. Soft documents arrive in emails, paperless server Inbox, flash drives, hard drives and our secure client portal. When we are finished with your paperwork, it returns to The Paper Sorting Department for reorganizing, packaging and storage until you retrieve it or we ship to you depending on your arrangement with your Customer Service Representative. These friendly people sometimes work the reception desk because they have not yet been exposed to the trials and tribulations of contractor bookkeeping services. They are well paid and happy because they are doing the work they love in a clean well-lit comfortable environment. The Paper Sorting Department has their own special operations manual with detailed instructions, which means they know exactly know what to do. Having owned and operated several construction companies we are not soft, weak, timid bookkeepers that need pampering and are easily offended. In fact, quite the opposite, we require all staff members to have construction experience before seeking employment with us. They have to deal with all kinds of paper with coffee stains, dirt, mud and worse, wrinkled, crumpled and torn and have lots of patience. Construction Data Entry is like flying an airplane…95% boredom and 5% sheer terror! We have a process for keeping the data entry staff at the 95% boredom level and out of the 5% sheer terror part. These are nice people. They are well paid and happy because they are doing the work the love in a clean well-lit comfortable environment. Construction Data Entry Staff members have two large crisp clear computer monitors, snacks and beverages in an office with state of the art climate controlled system and all of the hardware and software tools they need to do their job. We do not allow them to work with the 5% sheer terror complex construction accounting transactions. They have their own special operations manual with detailed instructions so they always know what is expected of them. Their duties include checks, receipts, credit card transactions, debit card transactions; simple bills reconciling bank statements, credit and debit card statements and vendor statements. Construction Bookkeeping is all about the other part of flying an airplane…the 5% sheer terror part! We have a process to help our construction bookkeepers work with high risk, high stress transactions. These are not nice people. They are well paid and happy because they are doing the work the love in a clean well-lit comfortable environment. Construction Bookkeepers have up to four large crisp clear computer monitors, snacks and beverages in an office with state of the art climate controlled system and all of the hardware and software tools they need to do their job. We allow them to work primarily with the 5% sheer terror complex construction accounting transactions because they have deep knowledge and are highly skilled in construction bookkeeping. Their work is very stressful due to the complexity of the transactions they are assigned. They have their own special operations manual with detailed instructions so they always know what is expected of them. 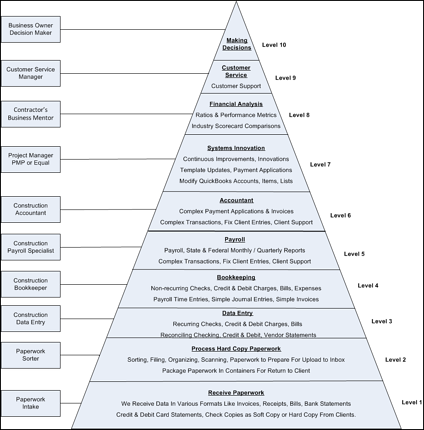 Their duties include non-recurring checks, bank transfers, wire transfers, sweep accounts, tracking retention due to you, tracking retention due to your subcontractors, setup and updating customer and vendor contact information, inputting time cards, simple General Journal entries, receipts, credit card transactions, debit card transactions, bills and employee advances and employee reimbursements. Construction Payroll is one of the toughest jobs of all because there are deadlines that must be met no matter what happens. This is also part of flying an airplane…the 5% sheer terror part! 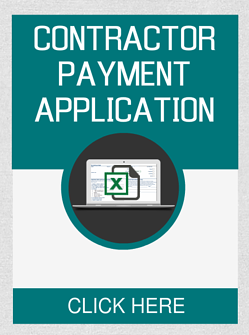 We have a process to help our construction payroll staff work with and manage contractor’s payroll needs. These people are un-bearable and we keep them away from the public whenever possible. They are well paid and happy because they are doing the work the love in a clean well-lit comfortable environment. Construction Payroll Specialists have one or two large crisp clear computer monitors, snacks and beverages in an office with state of the art climate controlled system and all of the hardware and software tools they need to do their job. 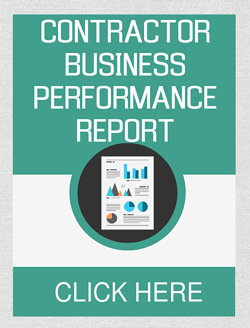 They are highly skilled in construction payroll with nerves of steel and laser focus. They have their own special operations manual with detailed instructions so they always know what is expected of them. Their duties include reviewing the time cards, preparing payroll, setup and updating employee records, employee advance repayments, W-2, W-3, 940 and 941 payroll reports, workers comp reports, unemployment reports, garnishment answers and payment tracking, child support and more. We do not prepare the checks or make any payments on behalf of Contractor Name. We do all the work behind scenes to make that step fast and easy for Contractor Name’s responsible person to complete. 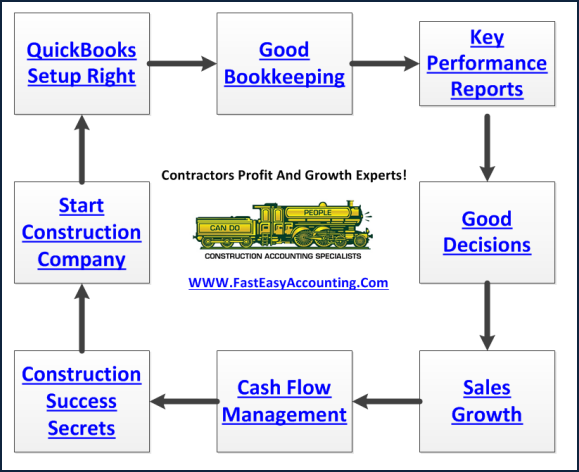 Construction Accounting is where the buck stops! No excuses and nobody to pass anything on too. These people are like Dr. Spock on the television series Star Trek, all business and no sense of humor. They do their best to make certain everything in the entire construction accounting system running smoothly, everything is where it needs to be and everything balances properly. We keep them away from the public whenever possible because if you ask what time it is they will tell you how to build a watch. They are well paid and happy because they are doing the work the love in a clean well-lit comfortable environment. Construction Accountants have multiple computers with multiple crisp clear computer monitors, snacks and beverages in an office with state of the art climate controlled system and all of the hardware and software tools they need to do their job. They are highly skilled at dealing with construction accounting issues. They have their own special operations manual with detailed instructions so they always know what is expected of them. Their duties include Fixed Asset management, depreciation schedules, complex Payment Applications similar to G-702 & G703, HUD-1 Statements, Inventory, complex Invoices with multiple Job Deposits and Payments, complex General Journal Entries, Year-End Journal Entries from the annual tax preparer, setup and modifying Chart of Accounts, Items, Report Structures, Insurance Audits and more. Project Managers at Business Consulting And Accounting are responsible for making certain that we are constantly improving, innovating and finding ways to increase efficiency and effectiveness in our system that will make your experience of doing business with us easy, predictable and pleasant. Project Managers seek out new software, hardware and best practices from our competitors. 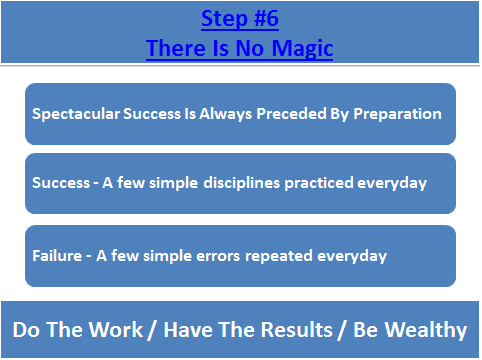 When they find something worthwhile, they add it to our Business Process Management (BPM) Strategy. These people are nice most of the time; however, their head is always in the clouds talking about finding ways to make everyone’s job easier with innovations and processes. They do not sit still very long. Project Managers have two large crisp clear computer monitors, snacks and beverages in an office with state of the art climate controlled system and all of the hardware and software tools they need to do their job. They are highly skilled in process development, innovation and highly organized. They have their own special operations manual with detailed instructions so they always know what is expected of them. Their duties include Business Plans, Process Development, Process Improvement, Systems Engineering, Six Sigma, Deming Methodology, MR>MC, Breakeven Analysis, Earned Value Reporting, Cloud Computing, Cloud Based QuickBooks For Contractors, Paperless Document Vaults, Cloud Based Financial Reporting and more. 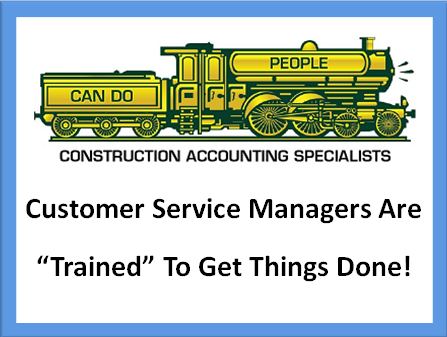 Contractor’s Business Mentor is a great person to get to know and spend time with because their job is to help you achieve your definition of success. 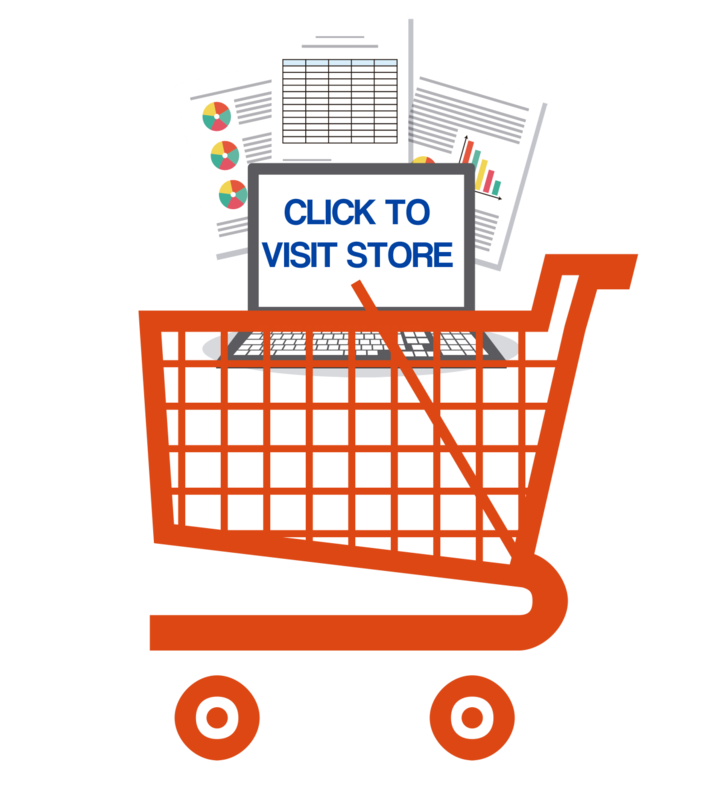 Helping you understand and use the financial reports one of the tools they use. Contractor’s Business Mentor works in several locations, their primary office and in the conference room with seating for ten people, state of the art climate controlled system and all of the hardware and software tools they need to do their job. In addition, they are mobile contractor’s business coaches who can visit your office or jobsite and perform a business assessment to determine if there are ways to get more production and increase profits. Everyone benefits from coaching, especially high performers. They sometimes provide so much good information that contractors have reported that two hours with our Contractor’s Business Coach in person, over the phone or during a web cast is a real treat! They have their own special operations manual with detailed instructions so they always know what is expected of them. Their duties are similar to the Project Manager except their primary focus is helping Company Name develop with Business Planning, Process Development, Process Improvement, Systems Engineering, Six Sigma, Deming Methodology, MR>MC, Breakeven Analysis. Contact Sharie at 206-361-3950 or email sharie@fasteasyaccounting.com for more information about setting at appointment for a session. Customer Service Manager is your primary contact at Business Consulting And Accounting similar to a concierge in a Five Star Hotel who caters to your every need, except there is no tipping allowed. They work have their own private office as well as several conference rooms and guest offices. They have their own special operations manual with detailed instructions so they always know what is expected of them. Their duties include being your single point of contact, which means you usually talk, email and communicate with the same person. This helps you develop a relationship with someone who listens and understands you and your company’s needs. They act as liaison between you and the rest of the staff at Business Consulting And Accounting. Feel free to ask for anything and they will do their best to accommodate you. They are always friendly, helpful and supportive. This person has extensive training and experience in construction office management, taxes, payroll, insurance audits and more. No matter what happens in your company if you need help or a referral for an attorney, annual tax preparer, chief cook and bottle washer this is you go to person. 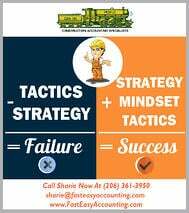 The head of the department is Sharie and she can be reached at 206-361-3950 or email sharie@fasteasyaccounting.com. As a construction company owner, you know which parts of your business only you can and should be doing and which parts to give to someone else. Good accounting records combined with Business Process Management (BPM) can help provide answers for making informed decisions. 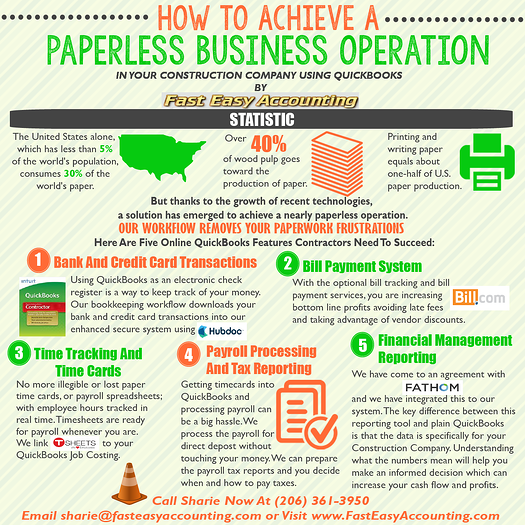 Every piece of paper has a story and your mind will replay that story repeatedly, which is why it is important to have someone else doing your contractor bookkeeping so you can focus on operating and growing your construction company sales and profits.